Becoming a PCBA member is a great way to meet other beekeepers. 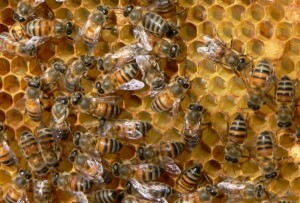 Learn about beekeeping at our monthly General Meetings and Apiary field days. Support PCBA in its mission to protect honey bees, and educate beekeepers and the public! For more information contact the PCBA Membership Services Chair at membership@pcbeekeepers.org. Annual membership is $30 per family residing in the same household, effective July 1, 2016. Click the “Pay Now” button to pay for your PCBA membership with a credit or debit card. Or sign up at any PCBA General Meeting. For location and directions, visit the Location Map page. You may also purchase Apprentice and Journeyman program textbooks or PCBA logo patches. Items can be picked up at the general meeting when you bring your receipt. - I knowingly and freely assume all risks, both known and unknown, even if arising from the negligence of the releasees or others, and assume full responsibility for my participation. - For myself, and on behalf of my heirs, assigns, personal representatives and next of kin, I hereby release and hold harmless the Pierce County Beekeepers Association, its officers, other participants, and if applicable, owners and lessors of the premises used to conduct the class (“RELEASEES”), with respect to any and all injury, disability, death, or loss or damage to person or property, to the fullest extent of the law, whether arising from the negligence of the Releasees or otherwise. NOTE: Your membership isn’t complete until you press the button and complete the online payment process through PayPal.